The 2018 International Conference on Marching Beyond the Libraries: Managerial Skills and Technological Competencies aims to focus on latest emerging technologies on how library and information professionals can explore and use the latest revelations of information technologies for effective and efficient management of their respective learning resource centres. There is a growing demand to manage the increasing flow of information both in and out of the library optimally, effectively and efficiently. In this context, managerial skills and technological competencies play the most significant role. 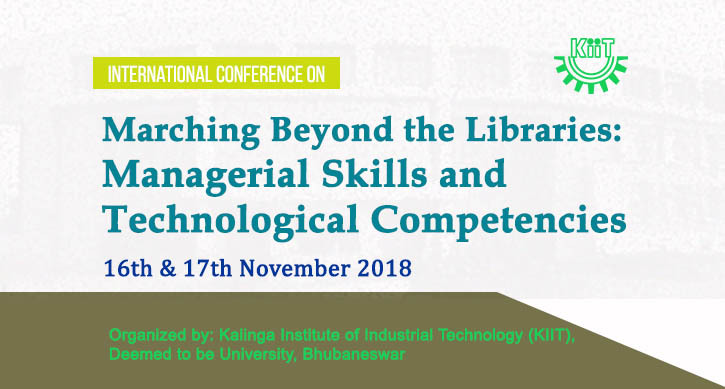 Therefore, the conference intends to bring together students, LIS scholars, academicians and industry practitioners, library managers and administrators on a single platform to review the latest trends of technological competencies, leadership and managerial skills. The conference will also review the quality of work required by the library and information professionals for adopting, sustaining, and promoting the new technologies with constructive recommendations. The conference is expected to have wide participation of delegates from India and abroad. There will be a half day work shop on the theme “Critical Thinking and Innovation”. In this work shop participants will showcase their creativity towards future librarianship.